Getting local publicity is a fundamental step when it comes to marketing your small business. In fact, for many small business owners, local marketing is the only type of marketing they know of and need. 1) Get involved in community events. Although donating money to charities is also a great way to give back to the community—tangible and visible involvement is ten times better. Community involvement is a very effective means of small business advertising and good publicity. Take part in charitable events, volunteer at community service projects or sponsor a local sports team. You’ll be known as the business that cares about others. 2) Start a community blog or newsletter. Another way to build up your brand is by starting a community blog or newsletter on local happenings and activities. You can take advantage of this community resource to network and ask other local residents and other businesses to contribute to your project. 3) Start a tradition or event. Start an annual tradition or event that the rest of the community can get involved in and look forward to. Plan something worthy of being featured in the evening news or the daily paper. Hold a crafts fair, a bake sale or even a community picnic on the first day of summer! 4) Take advantage of local media and various opportunities. Make the most out of local media and offer to write op-eds in your community newsletter or local newspaper. Get some airtime on well-known local radio talk shows. Opportunities such as these can quickly generate local awareness! 5) Join at least one professional or business organization. Just being a member of a reputable organization can be business advertising and publicity in itself. 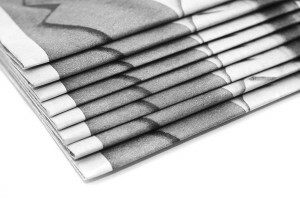 You can also take advantage of the organization’s perks, such as free promotion on their website or newsletter. The only way to get local publicity for your small business is to direct your marketing efforts to a neighborhood or community level. What Do Shoppers Want in 2009? Does Your Business Have A Website Presence? This is a Sponsored post written by me on behalf of InfoFree for SocialSpark. All opinions are 100% mine. Whether you're just getting started in business and don't have much of a customer list yet, or you've got an existing customer list that you'd like to beef up, there's a quick and easy way to get new sales leads and expand your mailing list. 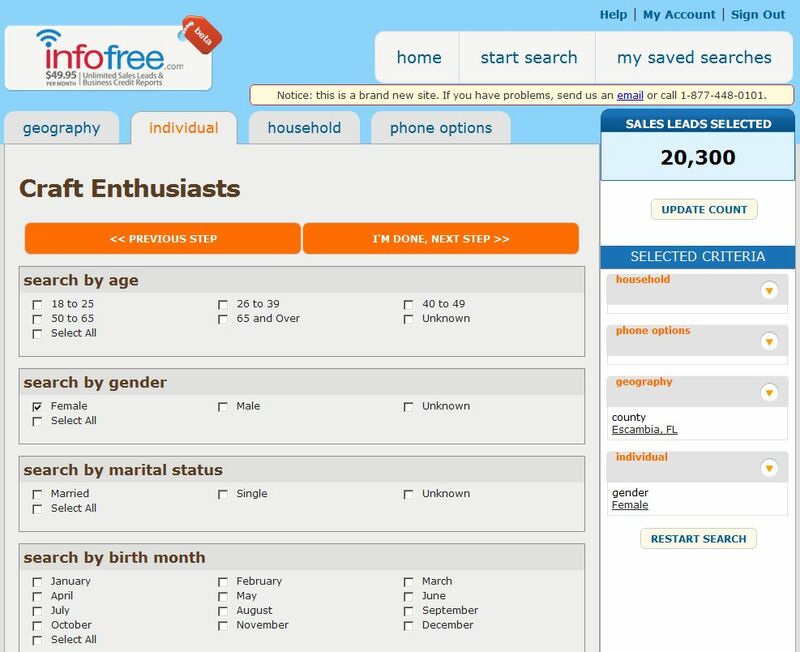 InfoFree is a new membership site where you can download unlimited sales leads and business credit reports. You can sign up for a free 24 hour membership to see what it's all about and check out how easy it is to search for sales leads. I signed up for a free membership and did a bunch of searching. There are over 50 databases to choose from and you can narrow down the data based on all sorts of factors such as location, hobbies, age, and income with just a few clicks. For example, I searched for only women who enjoy crafts and own their homes in my county and found over 20,000 sales leads. Once you've selected your criteria you have the option of "cherry picking" your favorite leads to download or you can click "download all". With their $49.95 monthly subscription, which you can cancel at any time, you can do unlimited searches and you can select, view and download the sales leads you have selected. After you've downloaded the leads you're free to call or mail them your brochures or sales information. This is a terrific low cost way to help get out word about a new business or to let people know about a big sale, then you'll be able to increase your sales as well as your active customer list! Why don't you head on over to infofree and sign up for your free trial right now? You'll be able to quickly see how thousands of new sales leads could benefit your business! If you’re a lover of all things craft-related, attending a craft fair is something you should definitely make time for. If you make crafts, however, then you may want to seriously consider selling your handmade works of art at craft fairs instead of just attending them. 1) You can interact with your target market. People who attend such fairs are genuinely interested in crafts. These fairs are a wonderful opportunity to chat with the people browsing through your products and get to know them a little better. Get feedback from them as to what they’d like to see you sell, and answer any questions that your customers may have. You’ll also be able to network with the other crafters at the fair and see what sells well for them. 2) You can create a customer database. A craft fair is a wonderful way to get more information about your customers. Ask interested customers if they’d like to be on your mailing list. Collect their home addresses, phone numbers or email addresses so you can send them product updates, catalogs or brochures in the future. At a craft fair, you are selling your items directly to the customer. This means there’s no need to pay any distributors or middlemen. Apart from overhead, fair fees and supplies, everything else is considered profit. 4) They require only a short-term commitment. 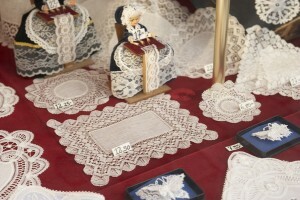 Craft fairs generally run for only one or a few days, and are usually held on weekends. Joining a craft fair will in no way take over your schedule! You can still hold a regular job on weekdays, or spend your time working on your hobbies. 5) You can learn from your previous craft fairs or shows. Another benefit of selling at craft fairs is that you’ll be able to quickly assess your performance at the end of each fair. You can decide to increase your prices, fix up your displays and increase your inventory before deciding to commit to a larger and more expensive fair. 6) You can work on your crafts and sell them at the same time. Take advantage of a fair’s slow hours to build up your inventory. Actually doing your craft work at the fair is a great way to get people to slow down, watch and ask questions. Craft fairs are not the only place that artists can sell their work however, these fairs are a wonderful way to build up one’s business. The next time you hear of a craft fair in your area—grab the opportunity and sign up! Launch Your Own Pattern Shop at Craftsy! The newly launched Patterns section of Craftsy is the fastest growing online marketplace for crafting patterns. Because Craftsy doesn’t charge designers any fees or commissions for listing or selling their patterns, creative indie designers are rushing over to the site to set up their pattern shops. Well over half a million active Craftsy members browse the thousands upon thousands of patterns of all types, for all crafts. It’s the perfect place to get inspiration and instructions at super low prices, or to set up your own independent pattern shop.